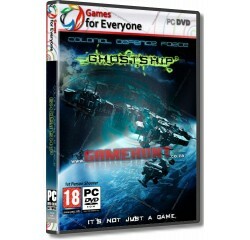 CDF Ghostship - R120,00 : Game Hunt, Where we lead, others follow. Over 350 years in the future mankind has embraced space travel and exploration. We have colonized many worlds and spread ourselves across the galaxy. The Colonial Defense Force (CDF) is responsible for the security of Earth and her colonies, and our only line of defense against the unknown. On March 1st 2368 contact was lost with our most distant colony, located in the Icarus system. Two days later the Dreadnought class spaceship CDF Goliath was dispatched to investigate. Experience the events that transpire as a Marine on the boarding party to the Icarus 3 Space Station and as a pilot returning from another mission a few days later. Discover what happened to the CDF Goliath and why nine days after entering the Icarus system it was finally declared a Ghostship. Old Style FPS shooter with fluid gameplay. Random Narrative, game events and random enemies for a real FPS challenge. Open world space craft with a practical design. Over 20 different enemies ranging from zombies to aliens and armed survivors. Multiple endings and a story which evolves based on random events and the choices you make in each game. Fast-paced and challenging waves of enemies in onslaught mode. 15 different weapons from 2 weapon types : Laser & Plasma. Explorer simulation where you can free roam the ship with no enemies. A new type of AI which offers challenging and unpredictable gameplay. Processor - 2.5 GHz Core i3® or equivalent AMD® processor. Video - 1 GB Hardware Accelerated video card with DirectX 11 Vertex Shader / Pixel Shader 3.0 support.